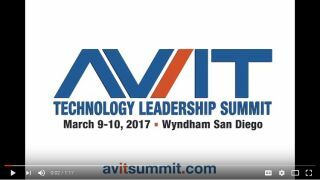 Join us in San Diego, March 9-10, for our next AV/IT Leadership Summit. The event includes lively panel discussions, 10+ AV/IT Talks, intimate discussion groups and networking with peers. Technology solution vendors will provide attendees an opportunity to share ideas, demo new solutions, and plan a roadmap. Meet with the AV Technology editorial team as well as representatives from Twitter, Gensler, Sony, Harman, Hall Research, Audinate, Clear One, and Varvid. We will focus on huddle space ecosystems, live streaming, AV-over-IP, the cloud, and we will also explore what’s coming next: AV/AR/AI, big data, networked AV security, and more. Join the discussion! Use #AVITsummit to ask questions via Twitter or Facebook.